Is a military coup possible in India? It seems like quite an unusual scandal broke out in India. On Wednesday, the Indian Express newspaper published a large article, reporting that in the night from 16 to 17 of January a motorized infantry battalion, stationed in the state of Haryana, and several units of the 50th airborne brigade, stationed in Agra, moved in the direction of Delhi. According to the information of the newspaper, this march had not been coordinated with the Ministry of Defence, and the government was “spooked”. Then an alarm was supposedly announced, and the units were ordered to return to the places of their permanent stationing. The newspaper was careful to avoid the word "coup d'état", only saying that it was a violation of the normal connections between the army commanders and the civil government represented by the Ministry of Defence. But immediately after the publication there appeared numerous comments actively discussing the theme of the military coup. And all this despite the fact that the Prime Minister Manmohan Singh, as well as the Defence Minister A. K. Antony, and the chief of the army headquarters General Vijay Kumar Singh completely dismissed the information of the newspaper as "groundless“. "This is absolute nonsense, - General Singh said. People spreading these rumours are trying to blacken the government and the army, and they must be called to account. " An expert of the Russian Institute of Strategic Research Boris Volkhonsky notes that in the information of the Indian newspaper one fact is unusual: during the 65 years of the independence of India, the army stayed absolutely out of politics, and India by right was proud of its title of the world's largest democracy, in contrast, for example, to the neighboring Pakistan. According to the expert, many people in India are not satisfied with the present government. But none of the political forces will support a military coup. This is true for the "system opposition" represented by the Bharatiya Janata Party, and for the "third front" that consists of a number of regional parties, as well as for various social movements. 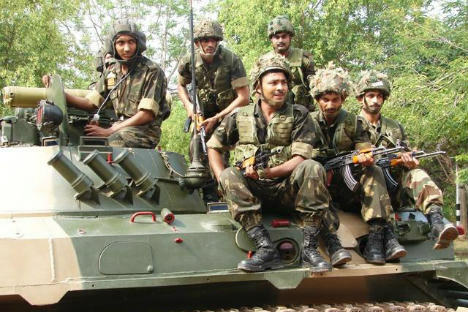 As for the army, it won’t ally itself with the Maoist gunmen (Naxalites). So the rumors about a possible coup d'etat are exaggerated, to put it mildly. In addition - and this was revealed in the course of scandals associated with the name of General Singh - India is facing a significant dilemma now: how to combine its claim for regional leadership with the necessity to live within its means as the growth rate of the economy is slowing down, and the exchange rate of the national currency is falling. India is the world's largest importer of weapons and that reflects its geopolitical ambitions. And at the same time, in his recent letter to Prime Minister Manmohan Singh General V. K. Singh describes the deplorable state of the Indian army. Situations like the personal conflict of the General with the Ministry or the events of the night from 16 to 17 of January, are not some accidental episodes, but a reflection of a system crisis, that has struck India and its armed forces, the Russian expert concludes.